Question-and-answer sessions between two or more participants, covering subject matter such as medicine, science, business, art, or social work. These can range from informal ten-minute talks to carefully scripted meetings with a series of participants. Moderated discussions consisting usually of eight to twelve carefully-selected participants. Many of our clients use focus groups to help them in positioning a product or service, to predict the outcome of a legal strategy (i.e. mock trials), and to better understand organizational problems and issues. Multi-person telephone conversations regarding corporate earnings, medical practice, product development, and other topics. We provide a few options here for the greatest level of flexibility. If requested, we can record these calls and coordinate with a conference call company to arrange the session, and we can provide the audio along with the transcript. Some clients also prefer to record the calls themselves, and we can then transcribe the resulting audio. Single-speaker talks, often followed by a question-and-answer session, taking place in locations such as colleges and universities, foundations, museums, and adult education centers, and used by foundations, non-profits, corporations, local governments, newspapers, and magazines. We produce easily readable and searchable texts of memorable speakers, using audio recordings in any format. Presentations or panel sessions, frequently requested by conference attendees, conference planners, and conference recording companies. 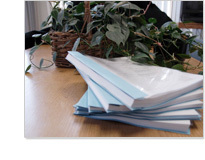 We can also produce transcripts of conferences we have recorded in the past. If you have a project idea you want to explore, give us a call. We will be happy to discuss it with you. We produce a wide array of certified legal transcripts: district court hearings, pleadings, bench and jury trials, custody cases, 911 calls, witness interviews, and voicemail messages. We cooperate directly with CPCS when provided with a NAC or a Motion for Funds from the court. Our legal transcripts are always fast and reliable. For verifiably accurate texts of witness testimony, we produce high-quality recordings and transcripts of depositions, which can be used both in discovery and in court. To best suit your needs, we offer a variety of formats: full- and condensed-page transcripts, E-Transcripts and ASCII documents, MP3 audio CDs, CD-ROM and DVD videos, videos synchronized with text, process serving, and others upon request. Our standard delivery time is seven to ten business days, and it can be expedited upon request.